“Before Mac Barnett was an author, he was a kid. Crown jewels + twelve corgis + paper dry biscuits + one kid spy = a formula for hilarity in Mac Barnett’s new chapter book illustrated by Mike Lowery. The afternoon I sat down to read it, Avery and Nate saw the cover and rushed over to join me, looking over my shoulder, all of us reading quietly at the same time and for some chapters, taking turns reading aloud. Their eyes were glued to the pages the whole time. It’s got quick wit, absurd humor with a glorious dollop of English history to boot. Mac Undercover is the first in the Mac B., Kid Spy series written by Mac Barnett, illustrated by Mike Lowery and published by Orchard Books. Book two entitled The Impossible Crime publishes on December 26. Is there a better pairing than Jasmine Toguchi and handmade mochi? In a recent visit to two small traditional mochi shops, irrepressible, spirited Jasmine came to mind. Debbi Michiko Florence’s chapter book series is one that Avery returns to and re-reads on a regular basis. Tried-and-true favorites. Isn’t that all you can hope for when you bring books home to your kids? That they’ll truly connect with them, bond with the characters in the stories and read them again and again. As promised, I’m working on a list of our favorite chapter books for the blog, and you can bet three sweet bites of mochi that Jasmine will be on the list. The four books in the Jasmine Toguchi series (Mochi Queen, Super Sleuth, Drummer Girl and Flamingo Keeper) were written by Debbi Michiko Florence, illustrated by Elizabet Vukovic and published by Farrar Straus and Giroux Books for Young Readers. Anyone else been missing best friends Ivy and Bean? 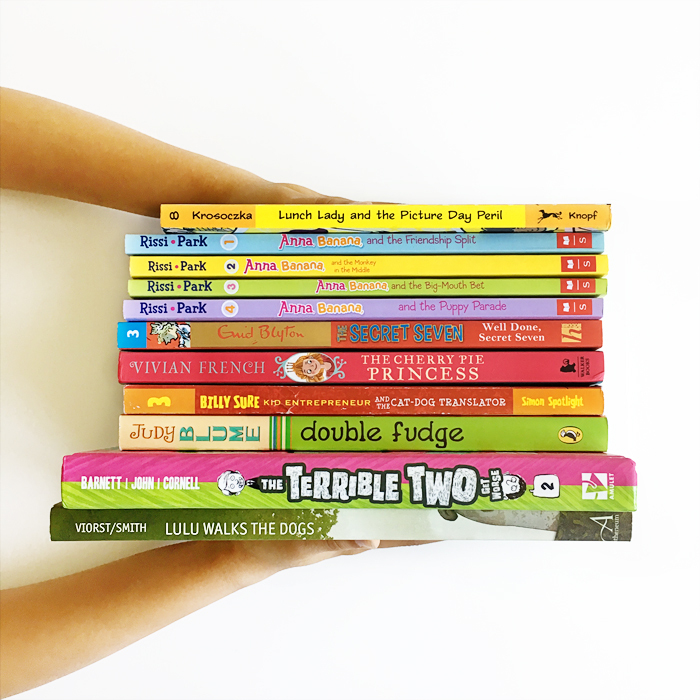 They’re back with book eleven and if your kids haven’t read the first ten, no worries — they have time to catch up! Ivy and Bean: One Big Happy Family will out on August 28. Ivy and Bean is a great chapter book series for kids who have become fluent readers and are looking for more substantial stories to sink their teeth into. Would anyone be interested in a possible post about our favorite chapter books for first through third grade? Leave a comment below if you are, or have any other bookish questions. The Ivy and Bean series was written by Annie Barrows, illustrated by Sophie Blackall and published by Chronicle Books. Visit Chronicle's site to read an interview with the Ivy and Bean team! A late update on #whataverysreading. Happy first day of summer and here’s to slower days, warm nights and catching up on all those books you wanted to read during the year (that’s me).